Driving the Golden Circle is one of the most popular attractions when visiting Iceland, the 300km route covers many of the countries beautiful landmarks from waterfalls to craters. Located a short distance away from the capital city of Reykjavik it has a become a popular day excursion for tourists or for those road tripping around the country. What is the Golden Circle? The Golden Circle is a 300km route which loops from Reykjavik out to some of the most beautiful spot in Iceland, including some UNESCO sites. Alongside the major points of the route, you will also find a variety of points of interest and beauty, giving you the chance to sample the diverse landscape which Iceland has to offer. It is possible to drive all of the Golden Circle in one day, and it is very common for people to do so. If you are travelling during the Summer you will not have any issues with taking as much time as needed as there is so much light, however if you are planning on driving the Golden Circle during winter (October – March), the hours of light are limited, so while it is still possible, you will need to leave early to make the most of the daylight. It is still possible to see the Golden Circle if you are not driving. Many tour companies offer one-day excursions from Reykjavik which offer all the same stops, plus you get the added benefit of being able to sit back and relax all day. We choose to drive when we were in Iceland, purely so we could have more freedom. 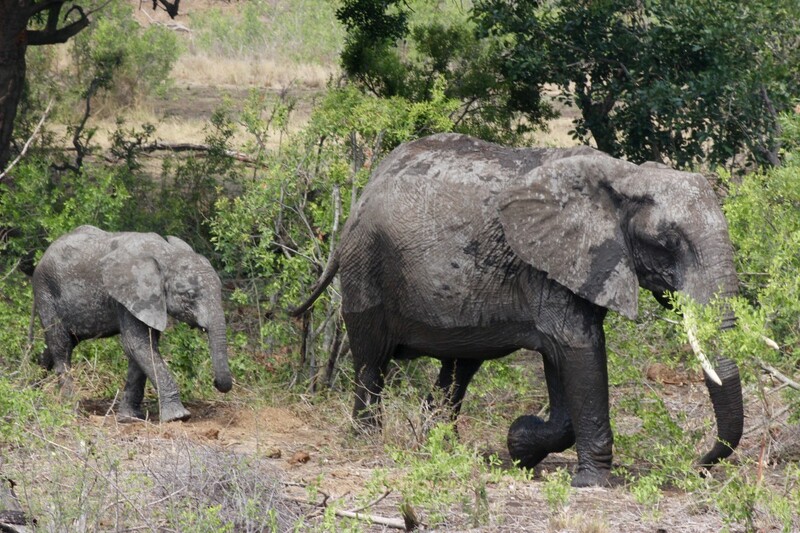 I am not the biggest fan of tour excursions, unless I am extremely limited on time, as I find you often get herded around and do not get the best opportunity to explore for yourself. Therefore the main benefit to self drive the Golden Circle in Iceland was the opportunity to take your time. You can spend as much or as little time as you want at each stop. You can also make unexpected stops along the way if you spot somewhere when driving – this is not possible if you are part of a tour group. You can decide to eat where you want. Many excursion tours will have allocated stops for where you can eat, as they are convenient, however, these places often tend to be at major tourist attractions, and therefore prices will be considerably more expensive. By self-driving, you can choose where you want to eat or even pick up food from the local supermarket before you head off to have a picnic along the way. Another benefit of self-driving is you can set off early. Excursions leave at a set time, most of the time this will be the same time as every other tour group, meaning it will be busy at the stops along the Golden Circle, especially during high season. As we were driving we choose to leave early to beat the crowds and even decided to drive the opposite way around the route, meaning we missed the tour groups at every stop. You may also find useful: Exactly how expensive is Iceland? How long does it take to drive the Golden Circle? Obviously, you can take as long as you want driving the Golden Circle and if you just want to do the highlights version you can probably get through it in 3-4 hours. It is important to remember your own limitations with long drives, ensuring you keep alert and safe. Depending on how many stops you want to take and how long for, the Golden Circle tour can last anywhere from 6-10+ hours. Renting a car in Iceland is extremely popular so there will be plenty of choices when deciding who to use. We rented with Lagoon Car Rental, who I would fully recommend, they have plenty of choice of vehicle types and offer a great competitive service. They also have camper vans if this is something you are considering as well. The type of car you choose may be dependent on when you visit. If you are visiting during the winter when there is a lot of snow it is advised you opt for a 4 x 4 rental. 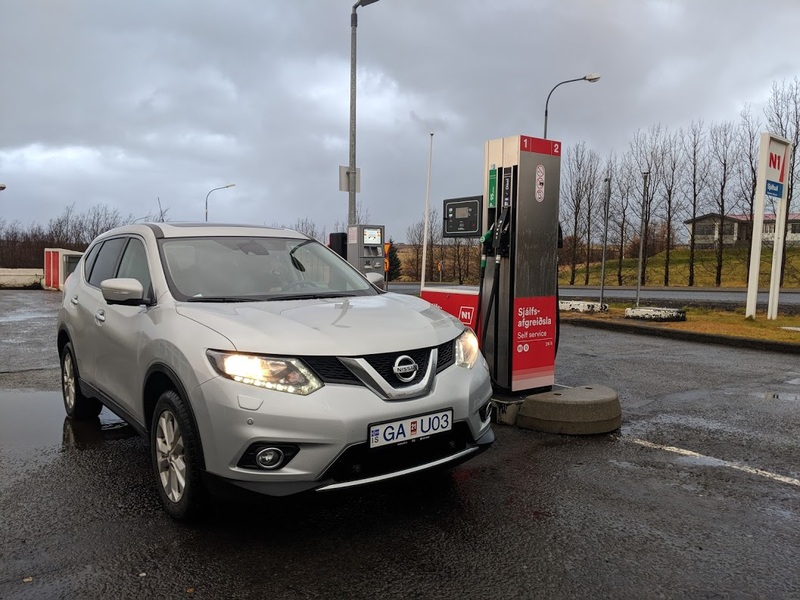 Both automatic and manual cars are available for rent in Iceland, as well as both Petrol and Diesel. Fuel is expensive at an average of 230 ISK per litre, and most rental companies will expect you to return the car with a full tank. It is advised that one top of normal insurance, you also get gravel protection. This protects against chips to the car paintwork from the gravel on the roads. 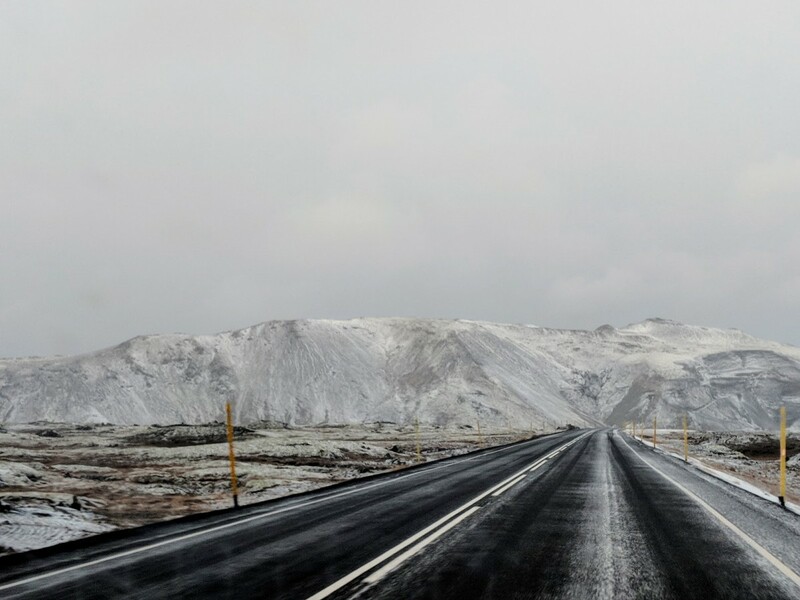 Before arriving in Iceland we heard horror stories about how scary it is driving in Iceland. We did not find it scary at all when there during October. Along the Golden Circle especially, the roads are well paved and nothing to be too concerned about. The roads are also relatively quiet, I found we were able to go at our own pace without being too concerned about anyone else. In Iceland, they drive on the right-hand side of the road and you must have your car headlights on at all times. The weather does change extremely quickly, so this is something to be prepared for. Also if you are driving during the winter with limited daylight hours, be aware that most of Iceland do not have road lights, meaning it gets extremely dark. If you are not confident driving in the dark, head back early. Stick to the speed limit, a speeding fine in Iceland will set you back around 5000 Isk! Alongside getting pulled over by the police, you also need to be aware of speed cameras, if you get caught by one of these, you will be charged by the car rental company. While in the UK we use postcodes to help us locate places, when driving in Iceland they input coordinates into their Sat Nav. Therefore it is important to note these down if you are planning your route in advance. While I do recommend using a Sat-Nav during your Iceland road trip, if you do not have one, the country is actually surprisingly easy to navigate and all major tourist attractions are well signposted. Thingvellir National Park is a UNESCO world heritage site, it is a key location in Icelandic history as the oldest existing parliament in the world first assembled there in 930 AD. Besides being a location of historical significance, Thingvellir is also protected as a national park due to its unique geology and natural features. It is here you will also find the Silfra Fissure, a crack between the North American and Eurasian continental plates, and it is the only place in the world where you can dive or snorkel directly between two continental plates. The Strokkur Geyser is an active fountain geyser located in a geothermal area beside the Hvítá River. It is highly active spouting 30ft of hot water into the air every 8 to 10 minutes. 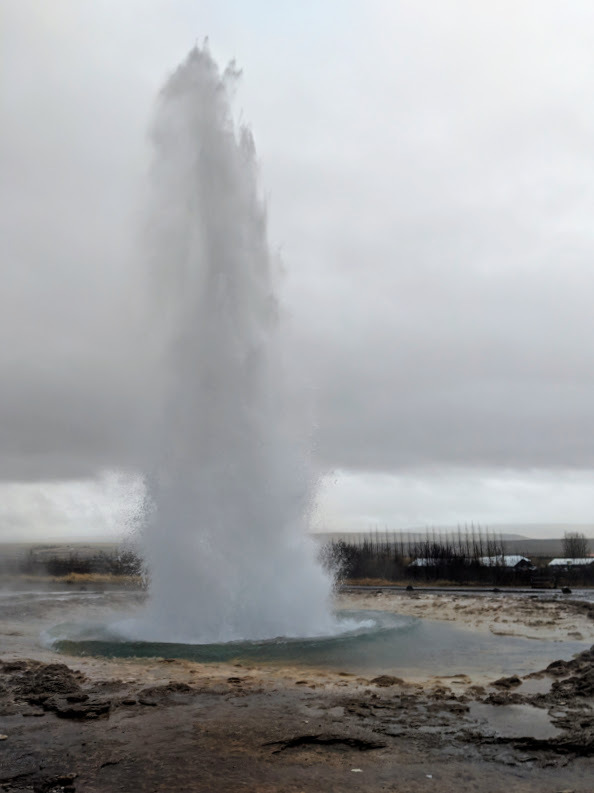 Aside from the active Geyser, this whole area is really quite stunning, if you following the walking trails upwards you will get a fantastic panoramic view of the geothermal area on onside, contrasted by a view of the ravine on the other. Entry is free into the Geothermal area, however, donations to preserve the area are encouraged. 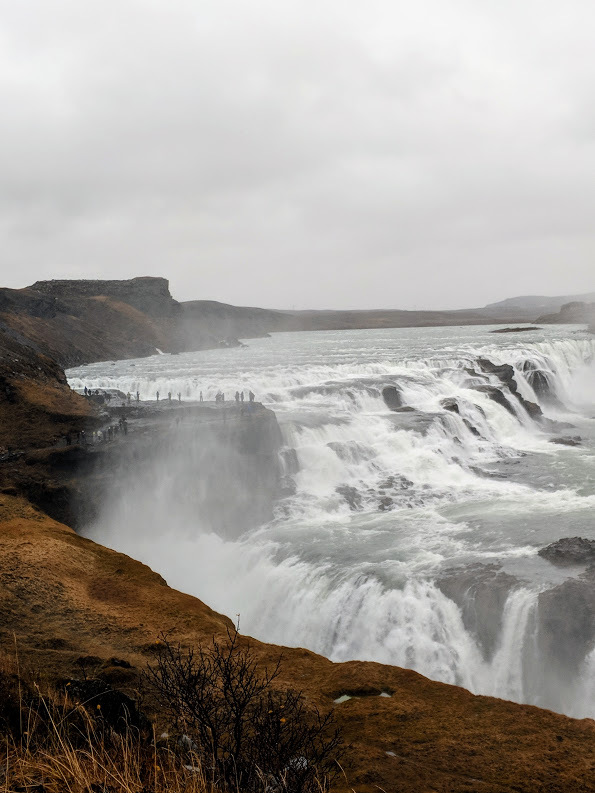 The next place you will come to when driving Iceland’s Golden Circle is the Gullfoss Waterfall, located in South Iceland on the Hvítá (White) river which is fed by Iceland’s second biggest glacier, the Langjökull. 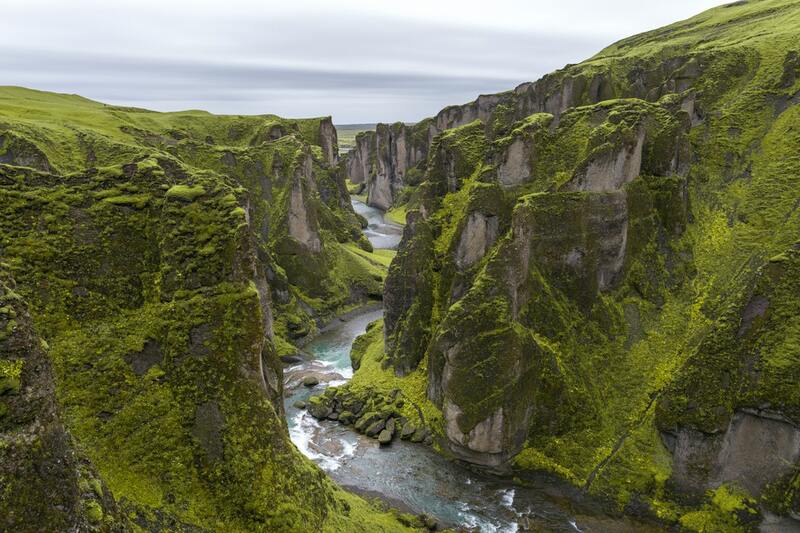 The water plummets down 32 meters in two stages into a rugged canyon which walls reach up to 70 meters in height. Be aware, especially on a windy day, you probably will get wet the closer you go! We saw many people wearing reusable waterproof ponchos in order to keep themselves dry. There are currently no entry fees into Gullfoss Waterfall, however, donations to preserve the area are encouraged. Gullfoss is more than just a pretty waterfall, it has a story to tell. In the early 20th century foreign investors wanted to harness the power of Gullfoss to produce electricity. In 1907 Howells, an Englishman wanted to buy Gullfoss from Tómas Tómasson, a farmer who owned Gullfoss at this time. Tómas declined Howells´ offer to buy the waterfall but later he leased it to him. The farmer´s daughter, Sigriður Tómasdóttir who grew up on his father´s sheep farm sought to have the rental contract voided. Sigriður using her own saving hired a lawyer in Reykjavik to defend her case. The trial lasted years and Sigriður went several times barefoot on traitorous terrain to Reykjavik to follow up on her case. She even threatened to throw herself into the waterfall if the construction would begin. Her attempts failed in court but before any damage was done to the waterfall the contract was disposed of due to the lack of payments of the rent fee. The struggles of Sigriður to preserve the waterfall brought to people´s attention the importance of preserving nature and therefore she is often called Iceland´s first environmentalist. In 1940 the adopted son of Sigriður acquired the waterfall from Sigriður´s father and later sold it to the Icelandic government. Gullfoss and its environs were designated as a nature reserve in 1979 to permanently protect the waterfall and allow the public to enjoy this unique area. 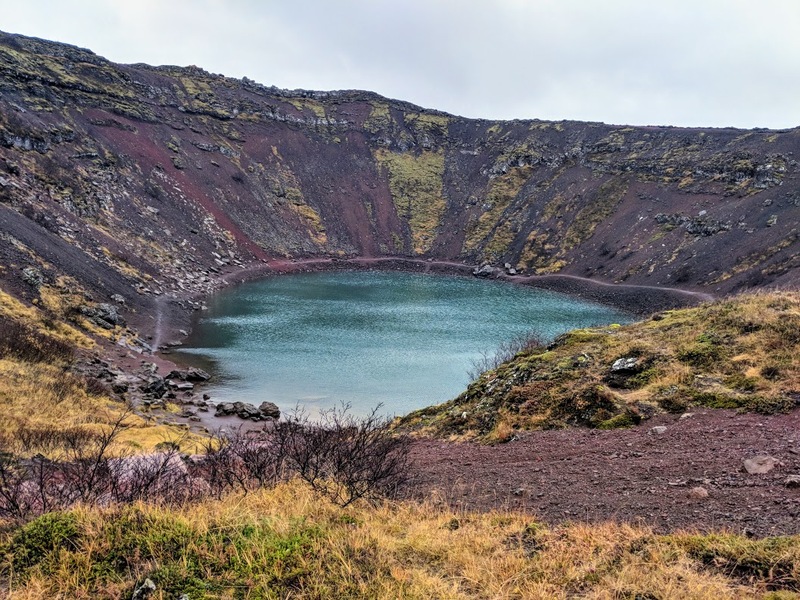 The Kerid Crater (Kerið) is another popular stop along the Golden Circle. Kerid is a crater lake created from a volcano which erupted and emptied its magma reserve. Once the magma was depleted, the weight of the cone collapsed into the empty magma chamber. I really recommend walking down into the crate as it is a lot more breathtaking at eye level than from above. The Kerid Crater Lake is the only major stop along the Golden Circle which has an entrance fee. The entrance per person is currently 400 ISK, all of which goes towards preserving the area. Faxi Waterfall has located around 12 km from Gullfoss Waterfall and the Geysir Geothermal Area. Faxi is a small waterfall, but absolutely worth a visit, as it also not one of the main stops it tends not to be as busy as other stops. If you driving the Golden Circle during Summer this would be a great location to stop and have a picnic. Icelandic ponies are adorable and you will find them all along the Golden Circle driving route, generally, most of them are very friendly as they are so used to tourists stopping and taking their photos. 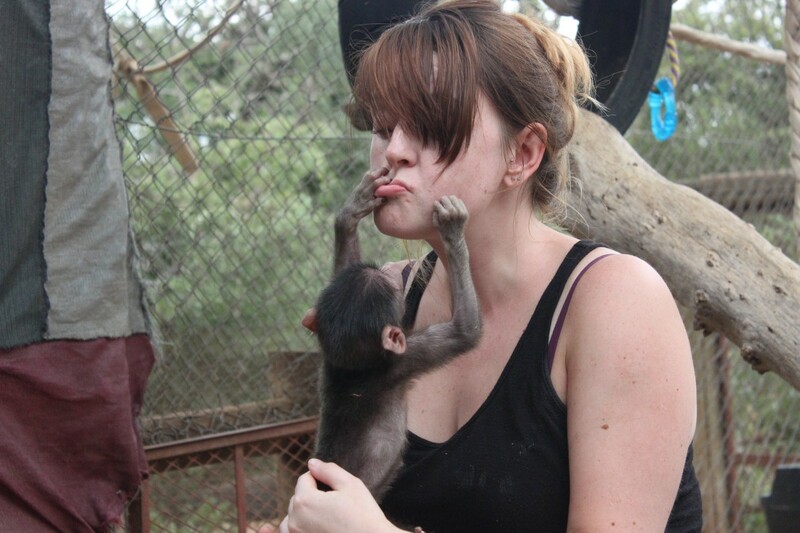 Despite seeing many people doing it, I would advise against feeding them as it may interfere with their normal diet. The Secret Lagoon is a magnificent natural hot spring located in the geothermal area in a small village called Fludir (Flúðir), 25 km from Geysir. The Secret Lagoon is one of the oldest geothermal pools in Iceland, having been built in 1891. The temperature of the water is about 38 – 40°C year-round and it is also a lot cheaper than visiting the Blue Lagoon at 2800 ISK (The entrance fee for children at the Secret Lagoon is free if they are under the age of 14). We spent around one hour here, but you are allowed to stay as long as you want. The Secret Lagoon also offers towels to rent, as well as free lockers and use of hairdryers. Sólheimar is a world-renowned sustainable community. It is one of the largest organic vegetable producers in Iceland. They run a small store where they sell locally-produced organic vegetables, baked goods, candles, and soap as well as ceramics, handmade wooden toys, and art. This unique village is very much worth a stop while on the Golden Circle. Sólheimar Eco-Village is located 30 km from Selfoss in south Iceland. On the downloadable Google Map you will find all points of interest that I have mentioned as well as recommended hotels and eateries. As it is easily accessible, most people choose to stay in Reykjavik when doing a self-drive tour of the Golden Circle in Iceland. If this is something you would prefer to do, I would recommend staying where we did in Reykjavik at The Swan Hotel and Apartments. The Swan Hotel and Apartments, Reykjavik: Situated a 1-minute walk from Reykjavik’s Laugavegur shopping street, these trendy apartments offer self-catering kitchen facilities and free WiFi. Restaurants, bars and cafés are just a few steps away. All units at boutique accommodation in Iceland feature a flat-screen TV, wooden floors and minimalist-style decor. A stovetop, toaster and tea/coffee maker provide convenience, while the large beds offer added space and comfort. However, we opted to start our Golden Circle drive from Stokkseyri. We found this area cheaper to stay than Reykjavik and also meant we had less driving when exploring South Iceland. We choose to stay in a private room at the Art Hostel and Apartments: Situated in the fishing village of Stokkseyri, Art Hostel and Apartments offers panoramic views of Mount Hekla and Eyjafjallajökull volcano. The property is located along the sea and a pier. The rooms all come with free WiFi access and heating. Most rooms have access to shared bathroom and toilet facilities. Some rooms feature a private bathroom with shower. We really enjoyed staying here, it also had an added bonus of a kitchen and free breakfast cereals. Meaning we could save money on a few meals. Due to the lack of light population, it is also possible to see the Northern Lights from the grounds on a clear, dark night. 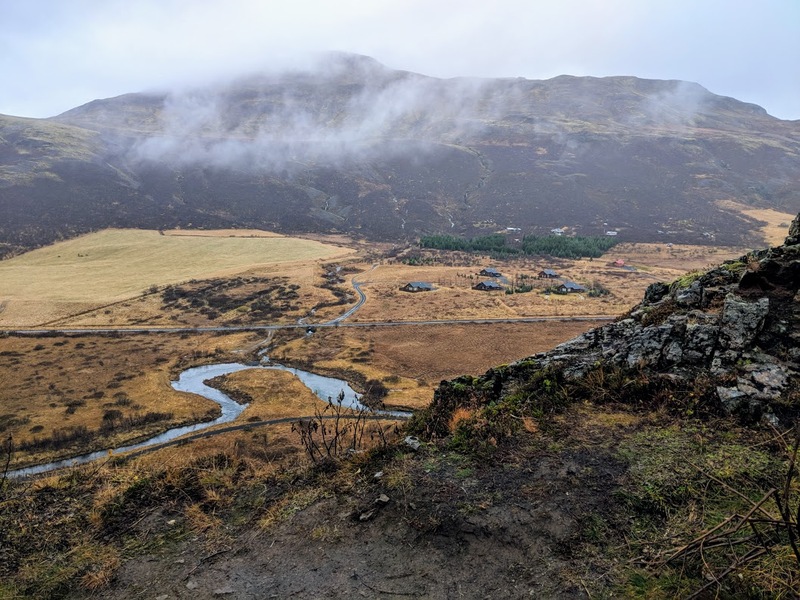 Along the Golden Circle route, there are cafes to eat at both the Geysir and at the Gulfoss Waterfall (both of which are also connected to souvenir shops) however, as I previously mentioned they are more expensive as they are catered just for tourists. If you are looking to save money and are visiting Iceland during the summer, I would advise buying food from a local supermarket to have picnics along your drive of the Golden Circle. We also saved money by bringing various breakfast bars and crisps from the UK to have during our drives. Drumboddstaðir: Also called Drumbó, sits on the bank of the Hvítá River and is best known as the base camp for white water river rafting in the south of Iceland. It is a great spot which serves beer and BBQ food. Olverk: Slightly off the route in Hverageroi but they serve incredible pizza (with many Vegan options) and it is also a craft beer brewery. Friðheimar: A restaurant inside a greenhouse where the grown fresh tomatoes, so much so they serve a whole tomato-themed set menu – including their famous tomato soup with fresh chunky bread.